Our partnership with you doesn't end when we hand you the keys to your new home. 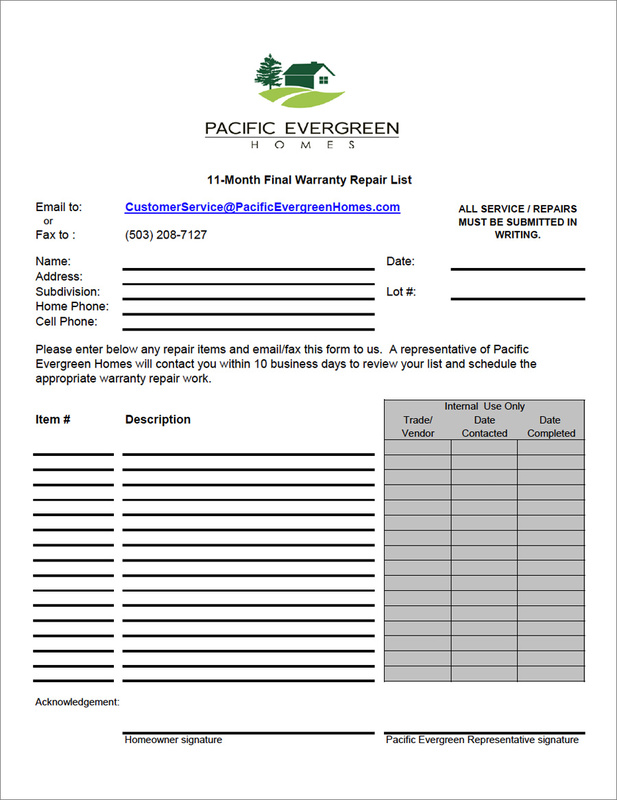 At Pacific Evergreen Homes, we've developed a unique, customer-focused warranty process that keeps us in close touch as you settle in. We start with a thorough homeowner orientation and walk-through of your home. We show you how everything works and make note of any items that need attention long before your first box is unpacked. We then present you with a valuable homeowner's manual--a comprehensive, easy-to-follow "how to" guide that takes the mystery out of home maintenance. Packed full of useful information, this document allows us to share our experience with home ownership and maintenance with you. Finally, we offer two post-purchase opportunities for you to report potential warranty concerns (see forms below). As your builder, we will attend to every detail so you and your family are as thrilled with your home as we are in creating it for you. To view our 60 Day Warranty Repair List on the screen, click the image on the left. To view a PDF version of the document, click the View PDF button below. To view our 11-Month Warranty Repair List on the screen, click the image on the left. To view a PDF version of the document, click the View PDF button below.